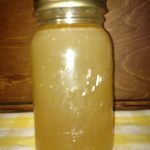 Bone broth is a super food that is rich in minerals. This can be drank out of a cup, made into a soup, stews, sauces or gravies. Place carcass in large stainless steel pot with water, vinegar ** and vegetables. Let stand 30 minutes to 1 hour. Strain the broth into a large bowl and reserve in your refrigerator until the fat rises to the top and congeals. Skim off this fat and reserve the broth in covered containers in your refrigerator for 2 -3 days or freeze stock in containers for later use. Makes approximately 2 quarts of hearty broth.